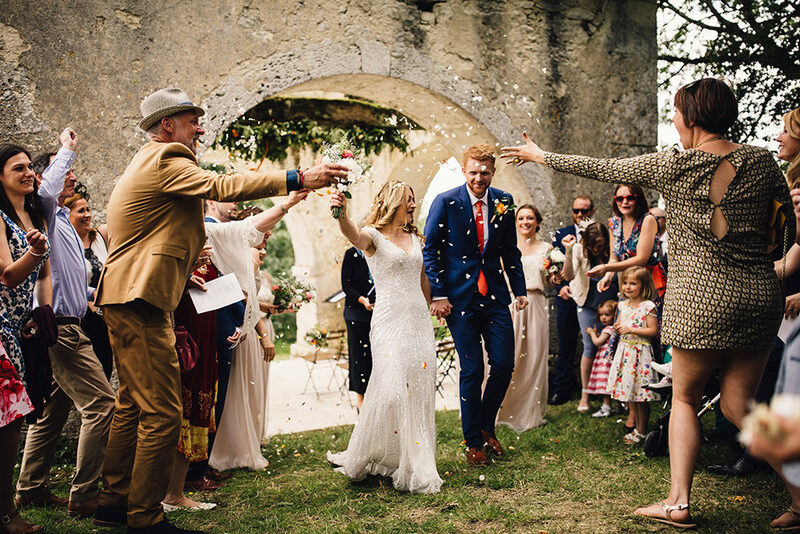 When RMW fave Samuel Docker sent us the destination wedding of Red on Blonde Photographers he labelled it “relentless fun and good times in France!’ And it is, it really is. 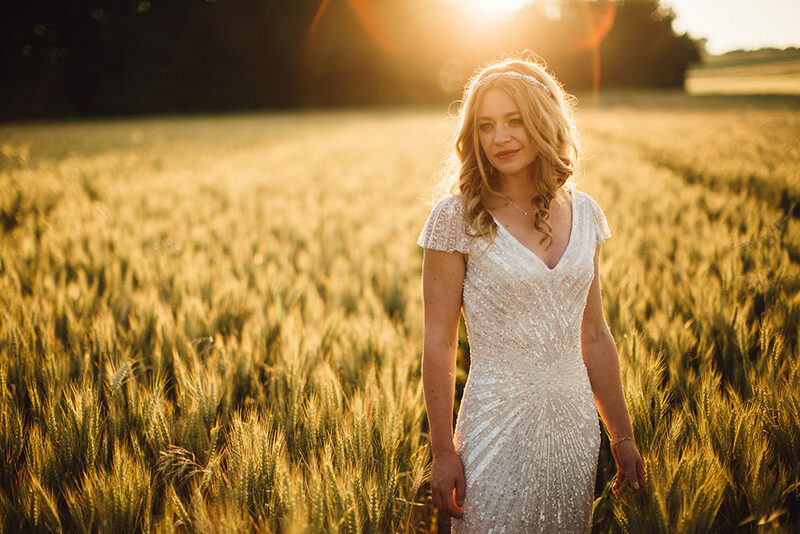 Sam really knows how to capture all those special moments, from bride Hannah’s lonely tear at the outdoor humanist ceremony to the cheeky little guests hiding under her exquisite beaded Eliza Jane Howell gown. With the Chateau de Puissentut making the most heavily backdrop for this non stop party. 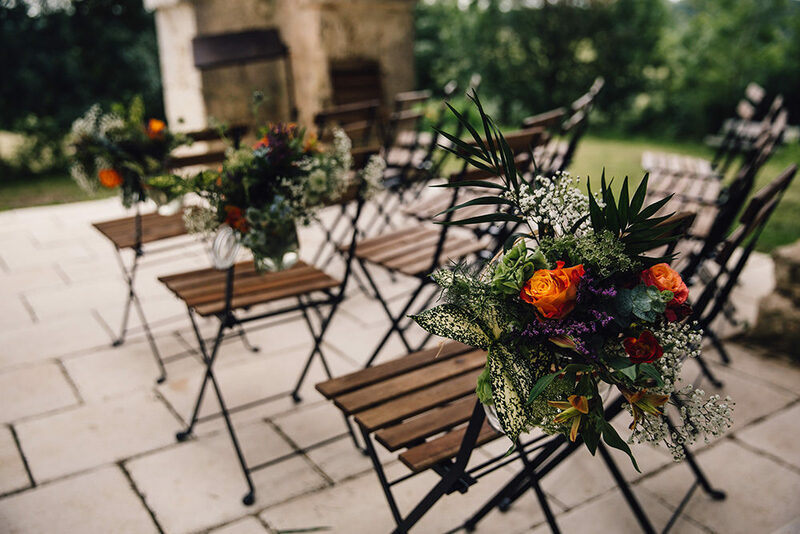 Planned and styled by Country Weddings in France with Protea flowers, greenery, copper and hints of Africa to pay homage to the couples love of the country. Just wait until you see the secluded ruins where they held the ceremony, not to mention the hanging florals! Apologies if you want to pack your bags. Serious wedding goals right here. Shall we get stuck in? Hannah the Bride: I guess most men don’t spend almost every Saturday morning with a woman in a wedding dress. My husband does because he’s a wedding photographer. This made my dress choice pretty tricky. He knows his Charlie Brears from his Packhams! We also had about 40 weddings to photograph before our own, so the odds of one of our brides having the same dress were relatively high. After a bit of a rocky & frustrating start to the dress search – travelling far & wide, trawling the internet & finding most designers I liked were only stocked in Australia I found Alexandra Anne. It’s the most incredible bridal boutique. Firstly the setting is stunning – just 20 minutes drive from my house (bonus!) on Chatsworth Estate & secondly you get Ally. She goes above and beyond and around the corner to make the whole experience of dress searching, fitting & wearing fun & special. She gives you 2 hour appointments, too, so you never feel rushed, which I found invaluable. The Eliza Jane Howell gown is the one I came out in & my Mum & best friend Amy were totally blown away. Amy cried! I loved the sparkle & the intricate patterns of all the beads. Along with Ally & Grace, the seamstress’s help, we customised the sleeves & nipped the dress in in various places, which transformed the shape. I felt so shimmery & gorgeous. I saw a headpiece by Victoria Ferguson, which was stunning & she agreed to make me a bespoke headpiece, which would look perfect with my dress. She was fabulous & sent me lots of bead samples & extra ribbons so I could get the exact look I wanted. Toby went with Paul Smith. He’d always wanted one of their suits & loved the blue colour. His tie was nice & bright & kind of brought out the colour of his hair & matched the orange of the flowers & our colour scheme for the day. 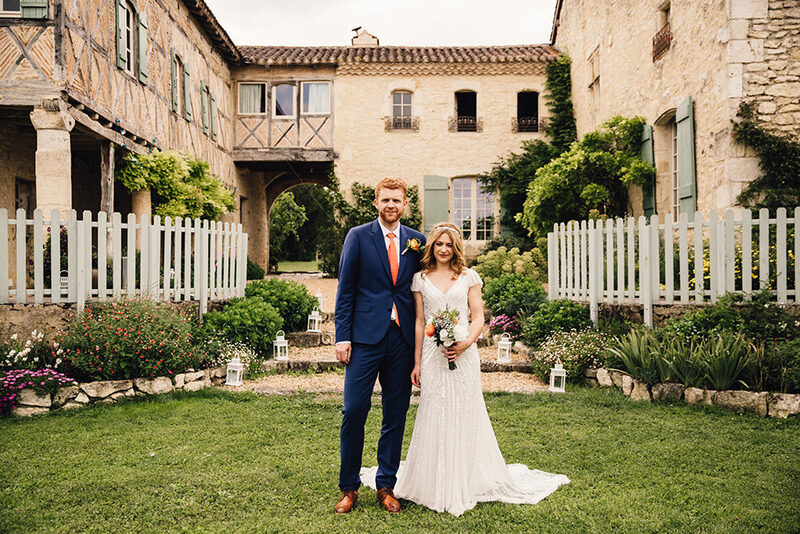 We wanted to celebrate our wedding in France because we loved the idea of having a holiday with our closest friends & family & we wanted the party to last at least a few days. Also, I lived in Paris for two years & wanted the opportunity to speak lots of French. The thought of mini breaks filled with wine, cheese & cake tasting was the final swing factor! La Belle France it was! Chateau de Puissentut felt perfect as soon as we arrived. It’s got that vibe about it. We could totally imagine sitting in the courtyard late into the night with the guitars out, sipping wine at the long tables. It felt like home (I wish!). It’s a beautiful old stone farmhouse outside and inside it’s super stylish. DK & Angela live there with their two daughters & Bloom the dog & a few cats, so it’s very relaxed & they’ve got amazing taste – the decor is really lovely in every room. The crumbling Pigeonnier made a stunning backdrop for our outdoor ceremony & there was an outdoor bar. What more could you want?! Apart from to actually live there! We lived the dream & felt like rockstars with our own country retreat. We were lucky enough to go on the trip of a lifetime to Kenya, Tanzania & Rwanda, which is where we got engaged. Africa kind of gets into your soul & doesn’t let go – we’re going to Botswana for our honeymoon! We wanted our wedding to have a loosely African theme. We named our tables after places we’d visited in Africa, our incredible guide Ahmad, the elephant we adopted & the gorilla groups we trekked to visit. I collected loads of wooden elephants to decorate the tables with & we set Toby’s Dad on to spray paint an animal place name holder for every guest. 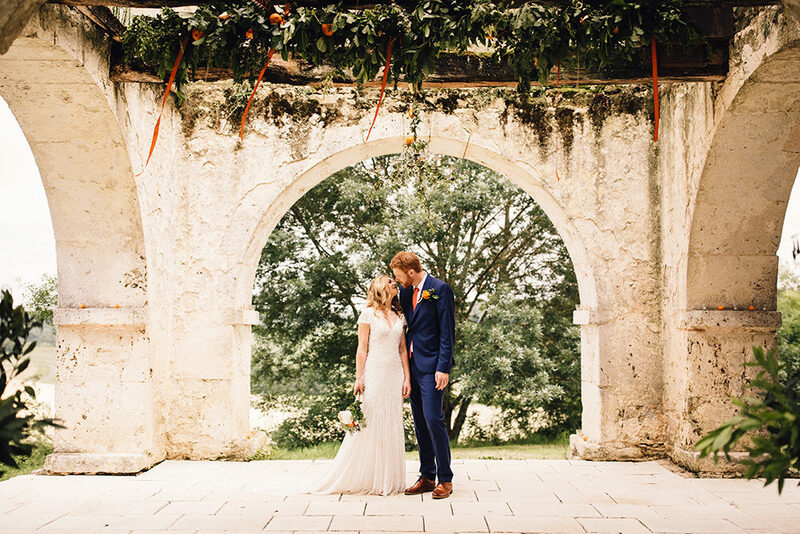 We wanted loads of greenery, wood & natural fabrics & we both love orange, so Amy, Toby’s sister incorporated these beautifully into the bouquets and flower arrangements. She also made orange garlands, which looked great strung across the barn. 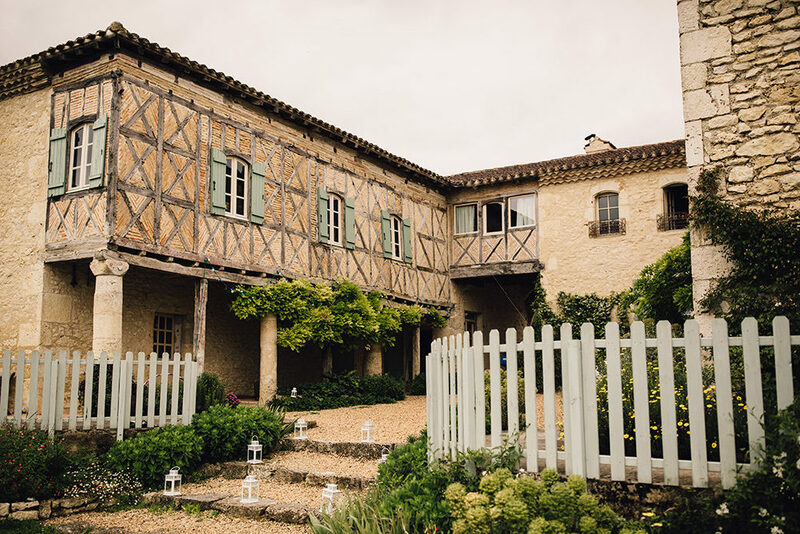 The pigeonnier looked incredible – we found an old chandelier & Patricia, our wedding planner decorated it & Toby’s Dad made lots of olive branch swags. It was quite wild & simple. We also wrote individual postcards for every guest to thank them instead of having favours & had loads of fun finding photos of us with everybody throughout the years, which were tied with twine underneath the postcards. 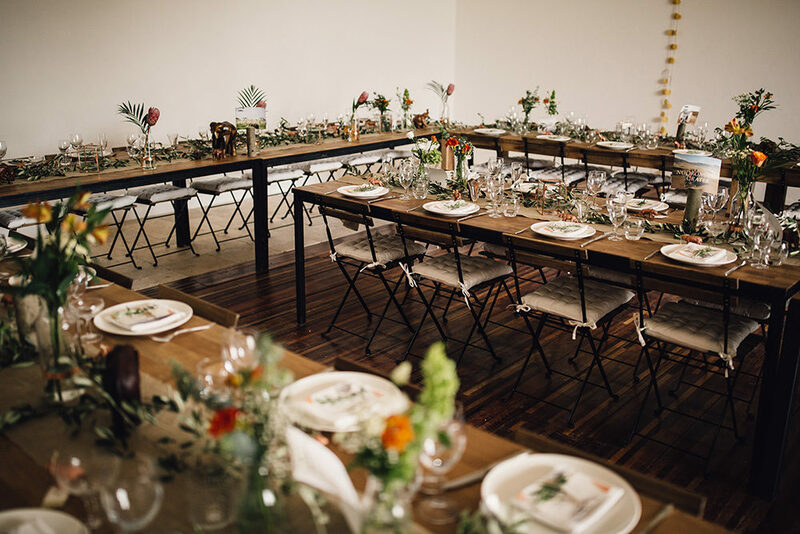 The orange looked amazing with copper tones, so we added some copper lanterns to the tables & used copper tape on Ikea vases to add a bit of wedding bling. 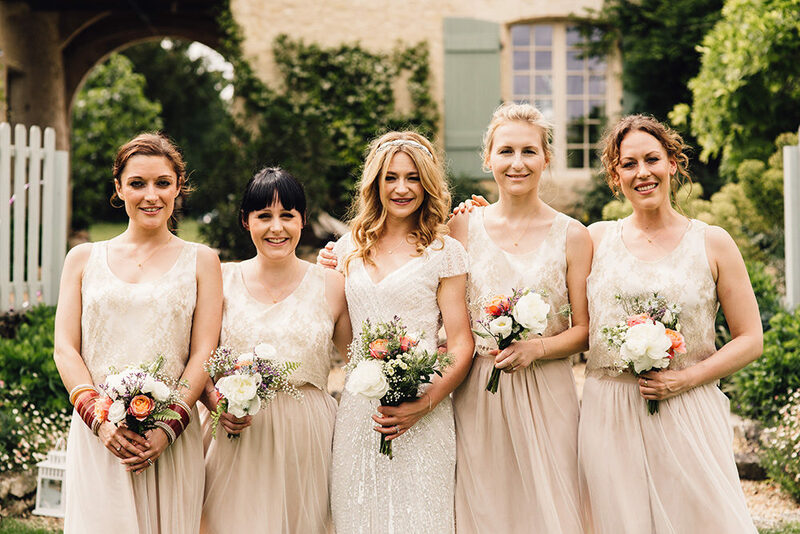 The super talented Susanna Greening designed & made our bridesmaids’ skirts & tops & they were exactly what I wanted & couldn’t find in the shops. I wanted separates because I thought they’d all like to choose a slightly different style top (turns out they all went for the same one!) & I hoped they might be more likely to wear them again. I wanted something elegant that they’d feel beautiful in & would blend in with our colour scheme. I love the super fine gold lace of the tops. Our best man had a Paul Smith tie & socks to match the groom’s & a blue suit from John Lewis. Lilia, our flower girl’s dress was from Monsoon & was a perfect find with gold elephants on it to match the theme & Sebbie, my nephew & our ring bearer wore a super cute outfit from John Lewis. The ceremony turned out to be one of my favourite parts of the day, with memories I hope will never ever fade. I was surprised by how incredibly emotional it was. We had a humanist ceremony, so it was very personal & unique. Toby & I love music so the songs we chose were very important. I loved standing with my Dad at the top of the hill & watching my bridesmaids walk in to ‘Strawberry Fields Forever’, one of my favourite Beatles songs. I walked down to John Martyn’s ‘I couldn’t love you more’, which had everybody in tears. My Mum read the most beautiful poem, which she’d written the day after I was born & she had added to it specially for the day. It’s truly wonderful & hearing it for the first time on my wedding day was EMOTIONAL! We also asked Toby’s Dad to read the lyrics to Bruce Springsteen’s ‘Should I fall behind’ – what a song. Our wonderful friend Sam Genders then played guitar & we all sang ‘Stand By Me’, which felt amazing. Redid a wine ceremony which went a bit wrong because we were supposed to have special wine & goblets but we forgot them, so it turned into us basically downing champagne. I didn’t mind!! Toby & I ran out through a tunnel of confetti to Bruce Springsteen’s ‘Born to Run’. We’re lucky enough to have some mighty talented musicians as best friends. In the early evening we held a mini concert. The incredible Sam Genders (of Throws & Diagrams) put together a fantastic set – he did an awesome version of ‘Blowin’ in the Wind’, along with some of his own material & sang ‘In Spite of Ourselves’ as a duet with my Mum. Liam Bailey (who you should check out – he recently performed on Jools Holland & wrote & performs ‘Blind Faith’ with Chase & Status) sang ‘In my Life’. Spine tingly awesome. Since I was 15 it’s been my dream that if I ever got married these guys would perform at my wedding. We felt so so lucky & honoured that they made my wish come true! As you can probably tell by now music was a huge part of our day & a big passion of ours, so it had to be right. For the party we had the best DJ Nick Boot, who did a wicked set. A local restaurant Le Barbacane did delicious food. The menu was inspired by Yotam Ottolenghi. All our food & wine was grown & sourced locally & chosen according to what was in season. I’m a vegetarian, so there were loads of fresh vegetables – we had huge artichokes to start, then sharing platters & loads of salads – panzanella, watermelon & feta, potato with shallots, lentils… veggies had asparagus & broad bean tart & the meat eaters had platters of slow belly roast pork & the local speciality – Toulouse sausages. We didn’t have a dessert. We went for the traditional French wedding cake, a croquembouche – a tower of profiteroles filled with pistachio & chocolate creams. It was divine. We were meant to have a cheese course but we were having too much fun & the speeches overran a bit so we forgot about it & the cheese boards appeared at about 2am. Perfect hangover prevention! We’re wedding photographers, so photography was pretty much the most important aspect of our wedding. And the first question everybody asked us was, “Oh wow who will you get to do your photography?” Everybody thought it would be a tough decision but it was actually very easy. 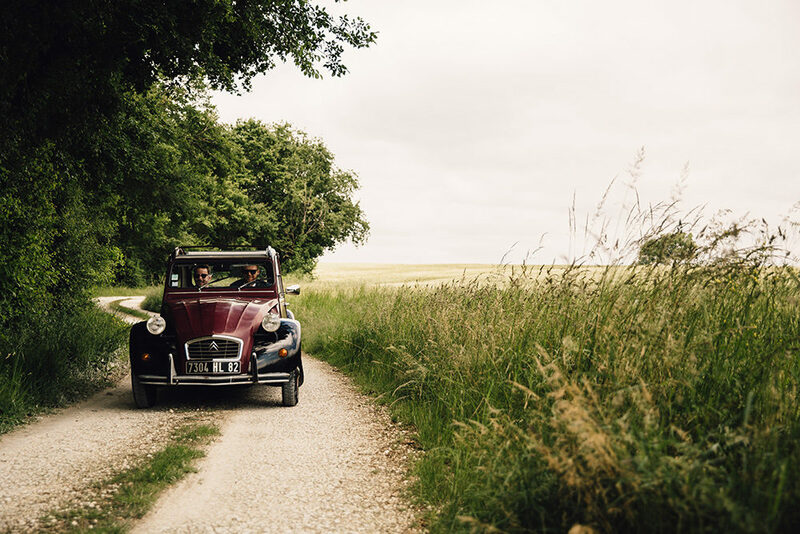 We knew exactly what we wanted – documentary-style, unobtrusive photography that tells the story of our wedding & captures the spirit of the day – the beautiful, funny, ridiculous, emotional, unusual, lovely stuff. As it was a destination wedding we also wanted a photographer who would be a guest & enjoy hanging out with us all. 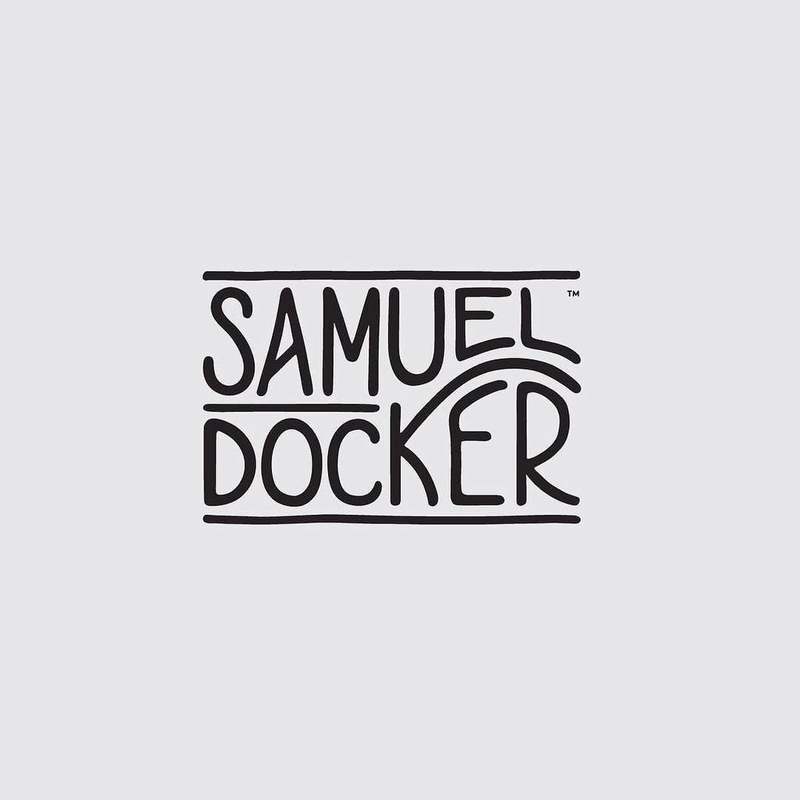 Sam Docker is a fellow photographer who is bloody brilliant & does everything we wanted & then some. He’s an all-round amazing man. We went with him. We had ultimate trust in everything he did & wow. We can’t ever thank him enough for giving us the best memories. We’re totally blown away by our photographs. If you could capture soul then this is as close as I think you’ll get. Truly inspiring. Stunning and Beautiful. I love your style of storytelling. I should in no way read wedding blogs as I am not engaged but I love the pretty! However I was bridesmaid for my best friend last year and can vouch for how amazing Ally and Grace are. When my friend left her last fitting I bid farewell to Ally by saying ‘I’ll see you in a couple of years when it’s my turn’. Now just to get back to dropping big hints to a certain someone. Beautiful wedding! Who was the Officiant? I visited Alexandra Anne Bridal Boutique, and Ally really was awesome! That’s great you had your friends provide the entertainment for part of the day! We always love playing at friends’ weddings – we feel it’s a really personal gift to them from us and we can tell they really appreciate it too. 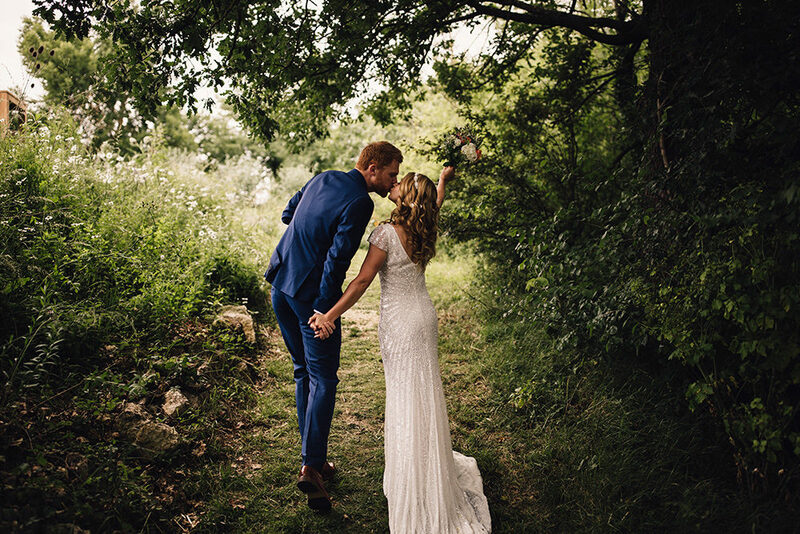 This was an amazing wedding to plan, I loved it from the very beginning when I realised Hannah and Toby had great ideas and memories to re-live. They were an inspirational couple to work with and I really hope to meet them again as photographers for other couples who come my way!